If you are like me you like to have a good cup of coffee. With a nice foam! But what is the best and most handy milk frother to use? Well the answer to this question depends on your own preferences. Do you make foam for one cup a day or for more? Or do you prefer a more hands of electrical option? Do you want to use a microwave? Or a one machine must fix it all option? 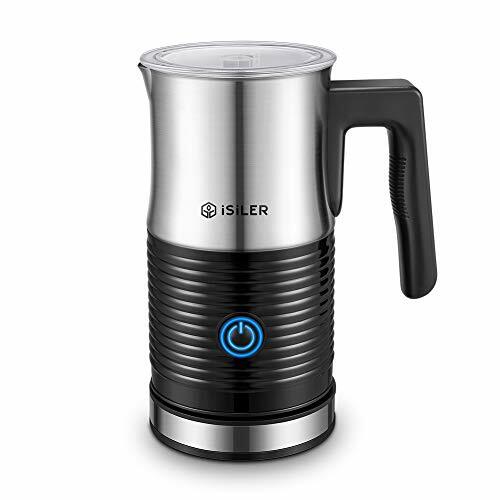 Here you will find a list of the best milk frothers for 2019. If you love to have nice and evenly frothed milk for your cafe quality mocha, cafe lattes and cappuccinos without going to a Starbucks, this milk frother reviews should help you out. Pros of the Nespresso Aeroccino Plus: There were some problems with the old version which are fixed now. There is no burned milk at the bottom anymore and it has a special coating so cleaning is easy. And, for those who like that, it is even possible now to make cold frothed milk. Cons of the Nespresso Aeroccino Plus: Though you can submerge it in water now, it is still not dishwasher proof. Pros of the Epica milk frother: It is a very silent frother and the price is nice compared to some other brands. Cons of the Epica milk frother: It can only froth enough milk for one cup. Some find the cleaning hard. You need to clean it every time you make a new froth and cleaning has to be done careful else water will leak on the electronics. 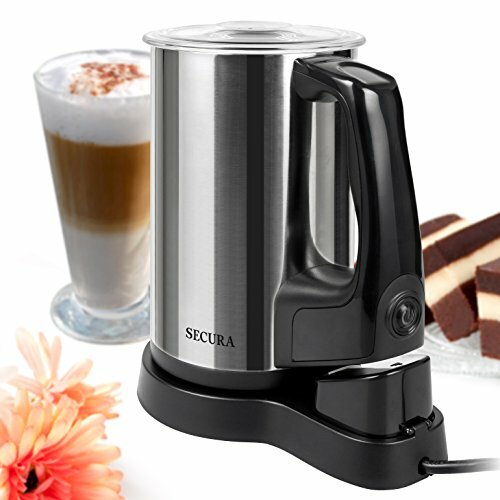 Pros of the Secura Automatic Electric Milk Frother 250 ml: This frother makes lasting milk froth. It is creamy and consistent. The frother is easy to clean as a special brush is included. You can make good hot milk froth as well as cold milk froth with it. And for those under us who hate noisy appliances, this one is not one of them. It actually is quite silent. 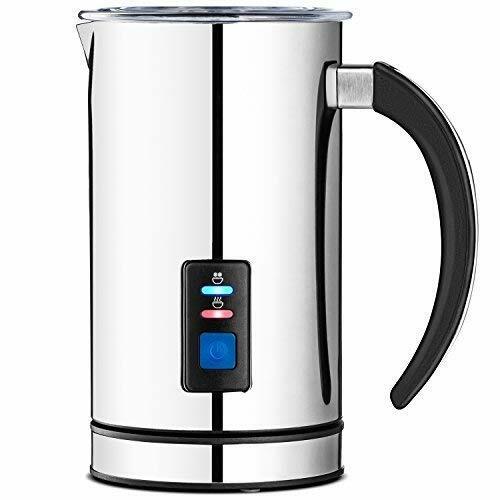 Cons of the Secura Automatic Electric Milk Frother 250 ml: Now and then there is a film of cooked milk on the bottom, which you will need to wipe out. Pros of the Secura Automatic Electric Milk Frother 500 ml: This frother makes lasting milk froth. It is creamy and consistent. The frother is easy to clean as a special brush is included. You can make good hot milk froth as well as cold milk froth with it. And for those under us who hate noisy appliances, this one is not one of them. It actually is quite silent. Cons of the Secura Automatic Electric Milk Frother 500 ml: Now and then there is a film of cooked milk on the bottom, which you will need to wipe out. A very good quality / price ratio. The Capresso frothPro comes in different colors and if you take all the colors together this is the best sold milk frother. Pros of the Capresso frothPRO: This frother gives a good thick milk froth! And next to that it is a very simple machine to operate and the pitcher and lid are dishwasher proof which makes the cleaning easy. Cons of the Capresso frothPRO: Sound a bit stupid to complain about this but the power cord is really short so if your output is far you will need an extra cable. And , much more important, the milk pitcher itself gets hot so be careful not to touch it and take care where you put it down when it is still hot. The frothing takes about 3-4 minutes so it takes some patience. “Frothing milk” — Is about the texture. The foamy top on your coffee. By “agitating the milk” you’ll get foam. This can be done in different ways like one of those mini battery whisks or by a plunger or by a electric milk frother. You can do this with milk of any temperature. “Steaming milk” — Is about the taste. It’s using the milk’s sweetness. You use steam to bring that sweetness out, it’s a kind of stretching the milk by steam jets. This method creates a more luxurious micro-foam. “Heating milk” — Well this one you know. It is easy as it just means heating it so your coffee doesn’t cool down when you put it in. Or heat it to make a hot chocolate milk. It doesn’t mater whether you put it in the microwave or in a pan on the stove. Pros of the Nespresso 3194-Us-Bk Aeroccino and Milk Frother: It takes about 1 minute to make Warm, frothy milk, so it is quite fast. The foam is nicely consistent and it gives enough froth for two regular servings. It is easily cleaned and a very quiet frother, almost silent! 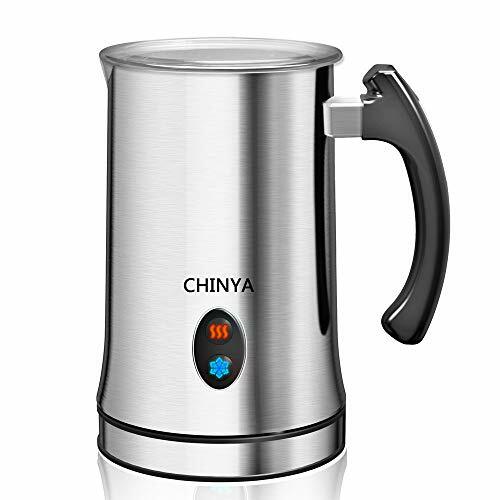 It makes both, warm or cool milk and it has one stirring device for froth and one for latte. Cons of the Nespresso 3194-us-bk aeroccino: With a steam wand the milk gets hotter. This frother cant’be used for heavy cream as the spinner is not strong enough. Pros of the BonJour Caffe Froth Maximus Milk Frother: Froths very well as the plunger fits in tightly, even better then the famous Bodrum according to some customers. Cons of the BonJour Caffe Froth Maximus Milk Frother: The glass is very thin so some people tent to break it easily while others own it for ten years. The solution to this is: Don’t drop it! – Use Zero fat milk. – Pump the milk gently while bringing the plunger above the froth level to create more air into the milk. Pros of the Melitta 43553 Milk Frother: This milk frother is easy to use and easy to clean as it leaves no burned milk on the bottom as some machines do. It gives dense and creamy froth. It is really handy that the heating element is separated from the frother cordless. In total a well built quality. Cons of the Melitta 43553 Milk Frother: It seems to be a really loud frother according to some reviews. 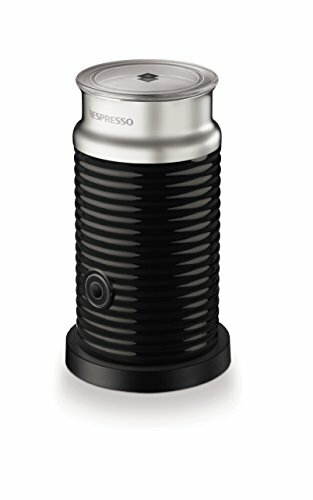 Pros of the Capresso Froth TEC: Finally a frother that you can put in the dishwasher (the glass vessel and the froth disk). The froth it makes is dense with real small bubbles. It is long lasting froth so the foam stays a while. The design is special. Probably like it or hate it. Cons of the Capresso Froth TEC: This is not one of the fastest frothers out there, so not great if you often use it for big groups. Also a lot of reviewers complain that it is difficult to wash on hand. There are also some complains that it is a little small for 2 cups of coffee. Pros of the Capresso 204.04 frothPLUS Automatic Milk Frother: Ehm, yes what to say… Well some people love it so it came on the top 10 best selling milk frothers list but there really are a lot of disappointing reviews online. Real good customer service though, which can come in handy. Cons of the Capresso 204.04 frothPLUS Automatic Milk Frother: It seems not to hold enough heat to build milk foam. Needs 2 to 3 cycles of frothing to get decent foam. Keurig milk frother – Not in the top 10 best sellers as it has a lot of bad reviews.